I’ve been out for a month now, and I’m still alive, so there are a few things perhaps you assume I’m doing. One of them may be feeding myself. Most of my calories are carbohydrate or peanut based. 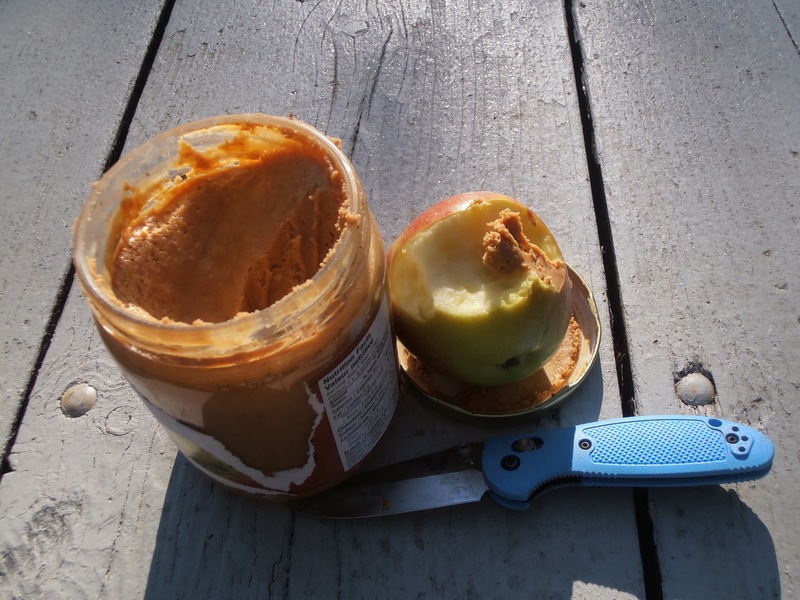 I snack a lot, I usually have raisins and peanuts (and/or other dried fruit and nuts) and maybe some other sort of snack in my handlebar bag. I think I’ve been eating more and more as time goes, perhaps I am hungrier or perhaps I’m just not as eager to start moving again when I stop as I was in the beginning, and for sure I am better at snacking while riding-so I munch a bit when I need more stimulation than the road alone can provide. 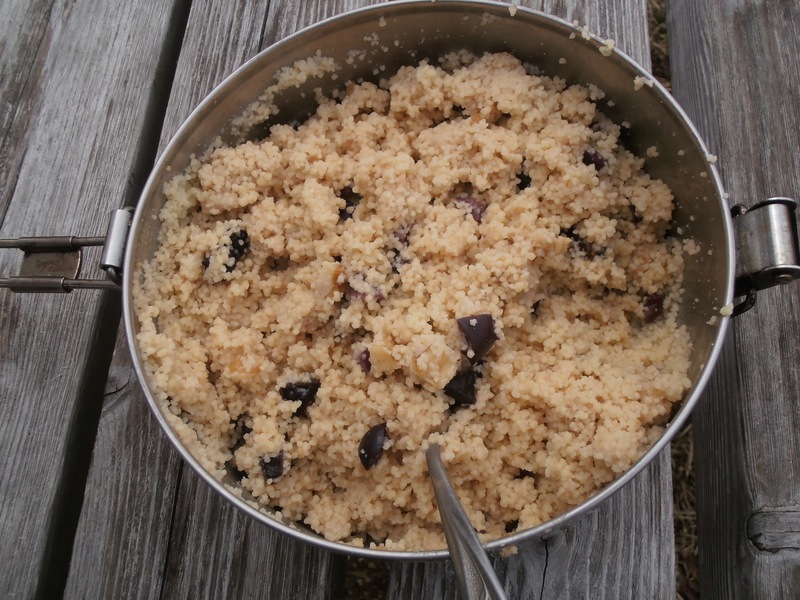 I eat a lot of couscous, which doesn’t need to be heated, it just soaks up water when presented with it and becomes edible. Adding prunes, olives, walnuts, and salt helps too. 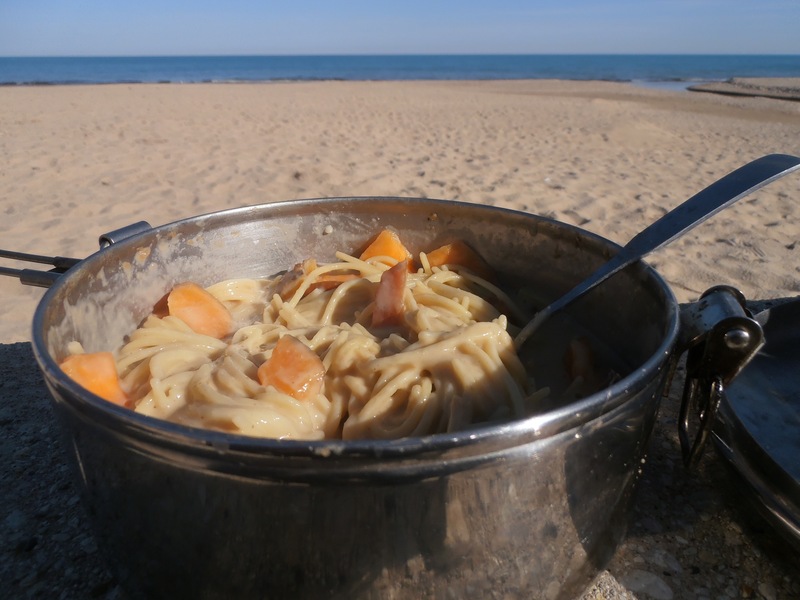 A pot of food is two or three meals. 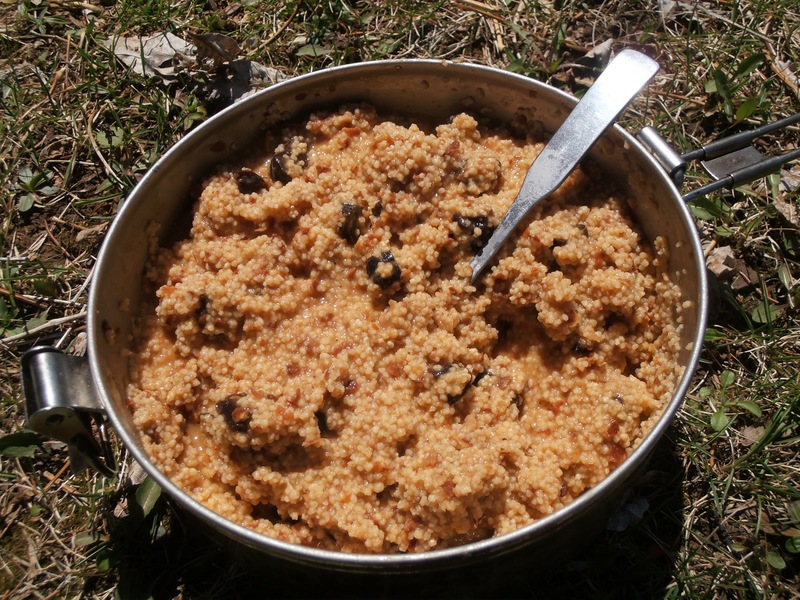 I sometimes carry dehydrated bean mush, which also rehydrates readily, and will mix it with the couscous for more flavor and protein and fat and whatever. There are also prunes in here, this was tasty. Rolled oats also don’t need to be heated to soak up water and be good to eat. 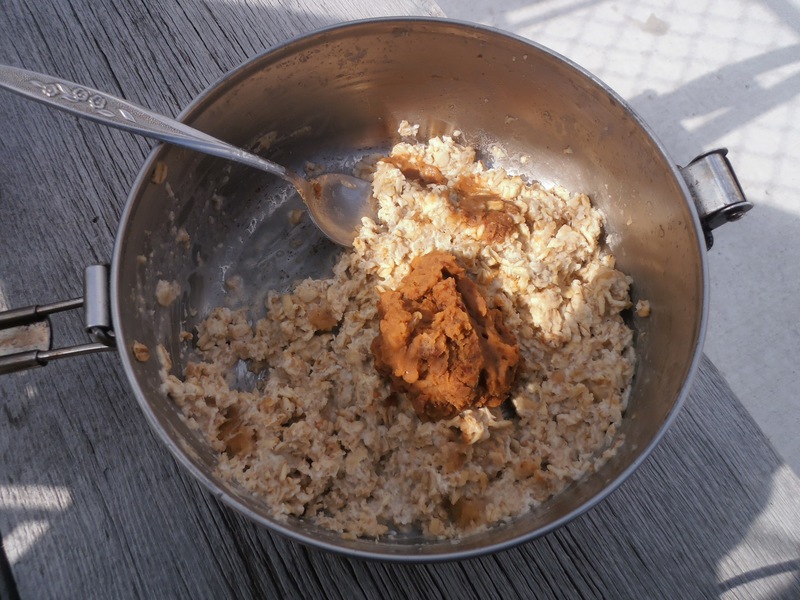 Bean mush may also be tasty with oats and peanut butter. If I’ve got greens I’ll put them in. They don’t travel well, but aren’t so hard to come by and I should really get them more often. 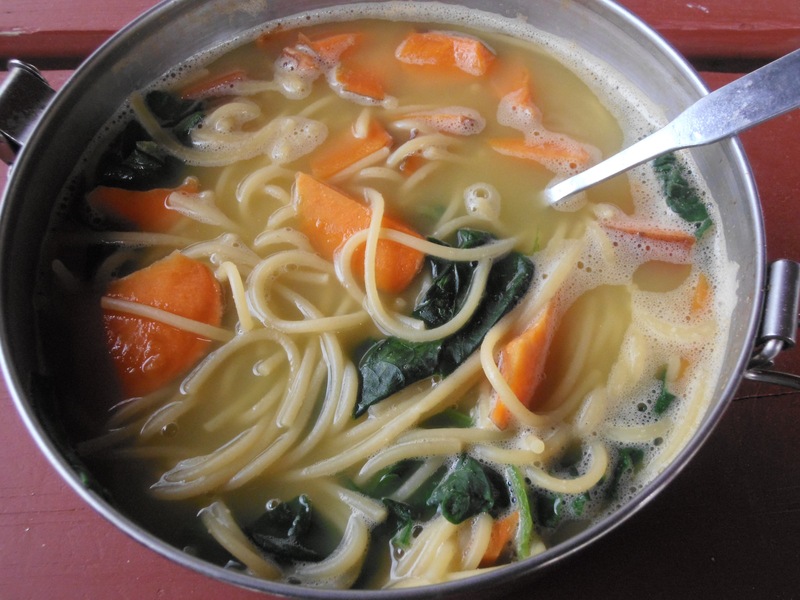 This noodle soup contains sweet potato, spinach, nutritional yeast, water and salt. 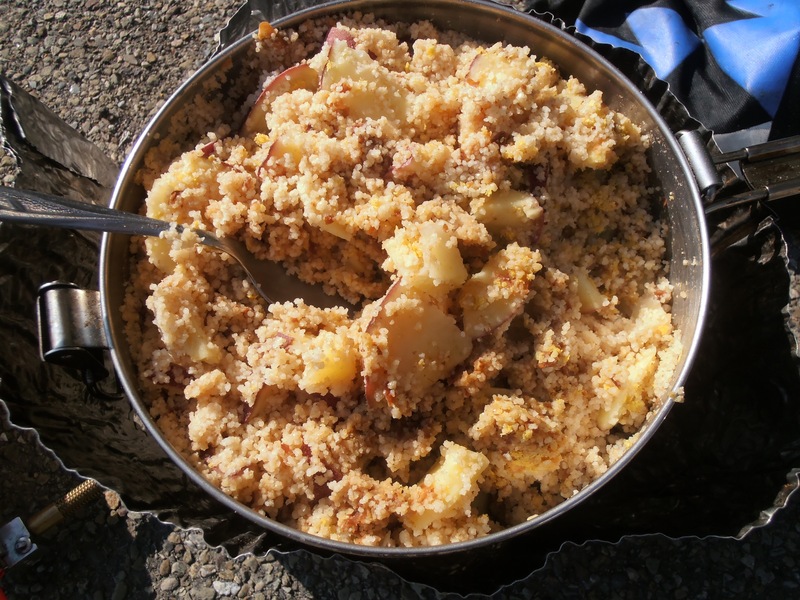 6 Responses to Road food! Yea! for the baby blue Griptilian! The eating part, too, but we all have our areas of interest. 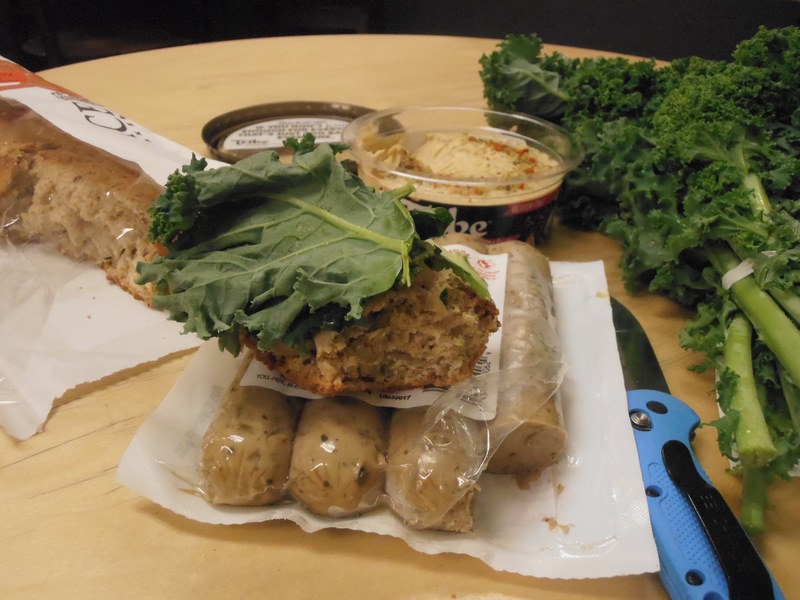 Is it true that sweet potatoes tremble at the sight of you? Close, its a mini grip. Good eyes though. Aryn: You are getting closer to your return into Canada. Have you obtained any out of country medical coverage yet? Oh to be young and free again. I have, thanks for mentioning it when we met. How come most of the food looks the same? Same great beige color, same pasty consistency? Did you at least bring some cayenne with you? I’m enjoying the food pictures! Enjoy Mexico! Adios!